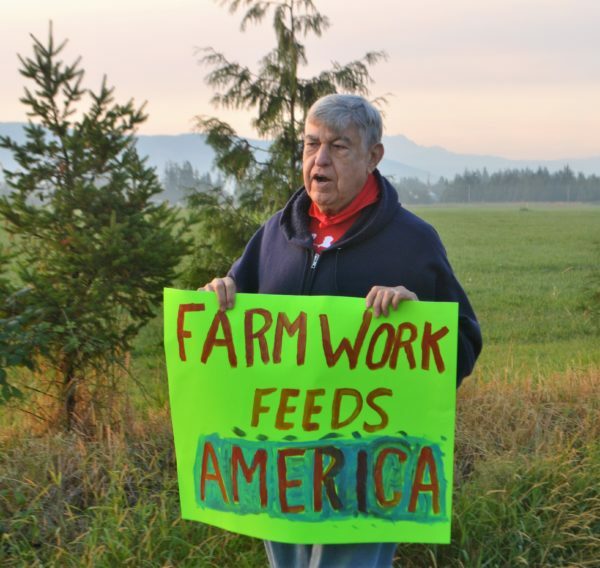 The National Farm Worker Ministry’s board returned to Bellingham, WA this August. 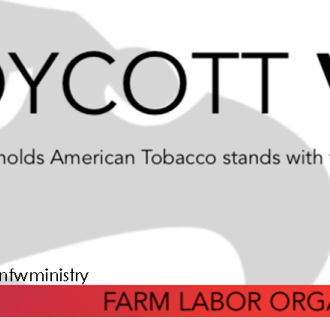 Previously, NFWM’s Board met there during the summer of 2015 to support Familias Unidas por la Justicia, the newest farm worker union in the country. At that time, we learned more about their campaign against Sakuma Brothers Berry Farm and endorsed the boycott against Sakuma and their major distributor, Driscoll’s. 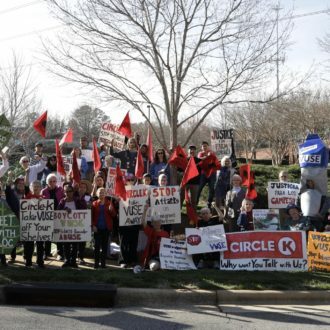 NFWM took the boycott national, launched a postcard campaign targeting the companies, supported local protests and met with the CEO of Sakuma and a Driscoll’s company official in Washington, DC. 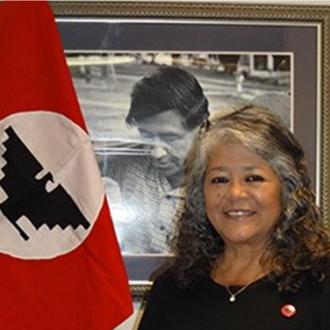 Just over a year after our endorsement, the boycott was successful and Sakuma agreed to negotiate a contract with Familias Unidas por la Justicia. Negotiations took months but farm workers had a contract when the berry season began in 2017 and it has carried them through 2018. 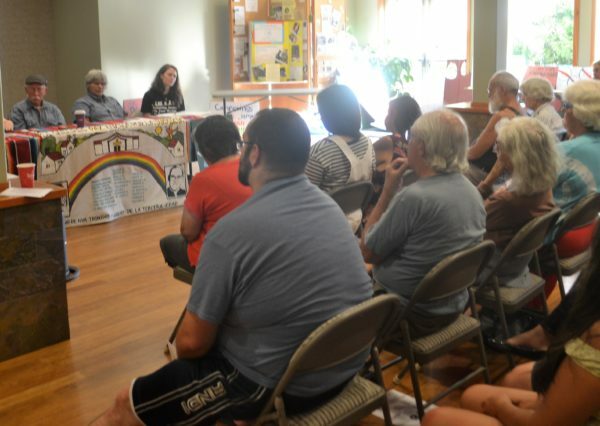 This summer’s board meeting was to reconnect with Familias Unidas and to support their ongoing work. While in Bellingham, Indira Trejo, Global Impact Coordinator for the United Farm Workers shared with us about organizing dairy workers and an upcoming action about which more is included in Action Alerts. NFWM’s Board also met the new executive director of PCUN, Reyna Lopez, who shared about their strong approach to community organizing and intersectionality. Reyna presented their Alliance Model, Alianza Poder, that includes their work in community organizing, their labor union, political activity and the community radio station they have all focused on organizing and education. 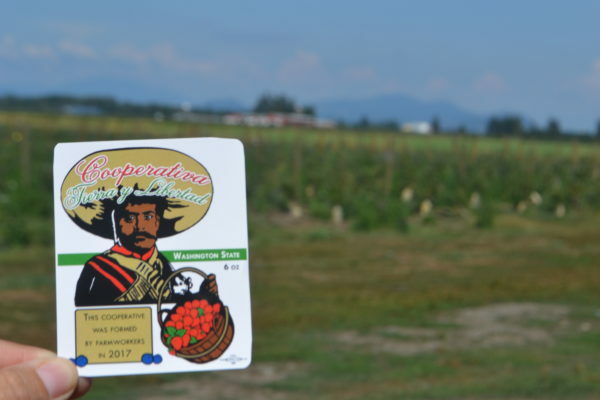 One of the highlights was touring Cooperativa Tierra y Libertad, a new worker-owned cooperative formed by farm workers to grow and sell berries in Skagit County. This is also a food sovereignty project of Community to Community, a nonprofit ally with Familias Unidas por la Justicia. This cooperative represents an important shift in power as workers are able through the co-op to democratically control their own means of production…to become worker owners! They are currently seeking capital for construction and land acquisition to purchase 90 acres of farm land for agriculture, housing and education so they can build an agricultural collective indigenous community. We were pleased to taste their blueberries and see their label. It was here that Joy Warren who represents Cumberland Presbyterian Church presented Ramon Torres, President of Familias Unidas, with letters of support written by children in her denomination and where she, through translation, shared some of their messages. Later Saturday evening we attended a Community Forum on the H2A Guestworker Program at Bellingham Unitarian Fellowship. The panel included Michele Stelovish (Northwest Washington Central Labor Council), David Bacon (Documentary Photojournalist), Martha Ojeda (Senior National Field Organizer for Interfaith Worker Justice) and our own Dominique Aulisio. In addition, David Wildman spoke from a faith perspective. Each helped us understand the challenges of the H2A system, the abuses of it and the importance of community awareness. 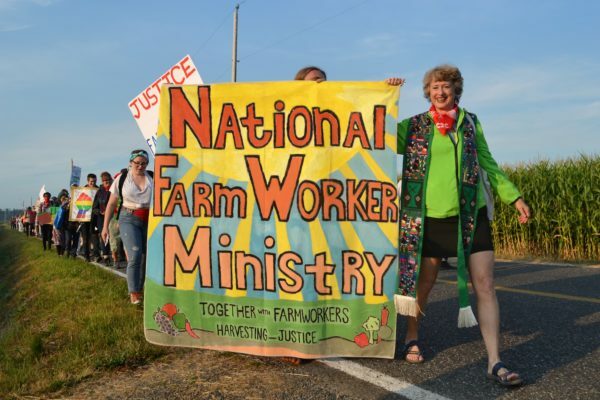 On Sunday, August 5th NFWM’s Board, staff and friends participated in the March for Dignity, sponsored by Familias Unidas por la Justicia, Community to Community, National Farm Worker Ministry and with the support of many others. They said the twelve miles would be a reflection on a day in the life of a farm worker, from the time they start work until their day ends, twelve hours. We walked on country roads that border Canada and by acres of raspberry and blueberry fields where the fresh berries that are stocked on our grocery shelves are harvested. 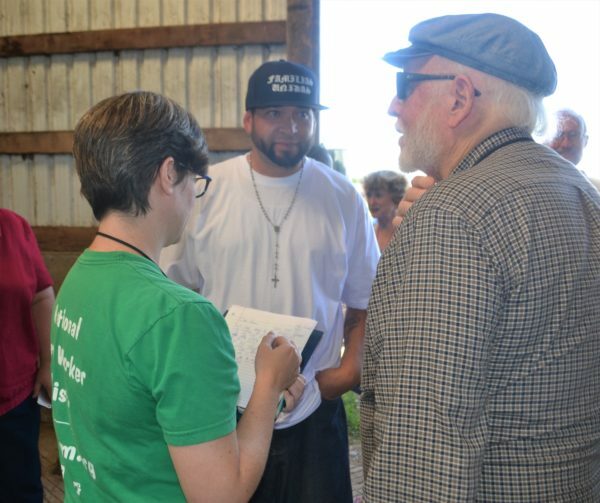 They asked us to see the heart of the local agricultural economy and reflect on climate change, the local food system, community building and labor issues in Whatcom County from a farm worker perspective. It was all that and more. Sunday’s march began in the parking lot of a strip mall with only the local quick stop gas station open for business. Prayers and words of encouragement were offered, including a prayer by our own Fr. Hector Rodriguez, as the fledgling marchers began to gather at 5:30 a.m. Their path would take them past a Casino that originally agreed to be the first major stop but later changed their mind and would not let some of the later marchers even park there. The next major stop was at Border Patrol/ICE Jail facility for a protest. The group’s size fluctuated at each stop but they kept marching. That was why we extended our board meeting to Sunday. The date for the march was set to coincide with the one year anniversary of this farm worker’s death, Honesto Silva Ibarra on August 6, 2017. Honesto was a 28 year old H2A worker from Mexico. After his death, 70 of his fellow farm workers left their work in protest of conditions at the farm and the lack of medical care for Honesto. They were fired. For several weeks after that, the workers camped out in a yard nearby at the home of the Suarez family. They called this site Camp Zapata. The march ended at this familiar site. At this last stop, Ramon Torres, President of Familias Unidas, distributed pins to all those who had completed the march as well as to those who had supported them. Marchers, farm workers, drivers, support persons all gathered to eat and rest and share with each other. The host family spoke, there were prayers and music and a memorial to Honesto, and twelve miles of memories to savor. A long day of reflection on farm workers, their conditions, their abuse, their loss AND their resilience and determination and commitment to the days ahead. At the front of the march was Modesto Hernandez, one of the founding members of the workers co-op and a member of Familias Unidas por la Justicia. He used a cane to get around at the farm so led the entire march from a wheelchair with a sign of Our Lady of Guadalupe. 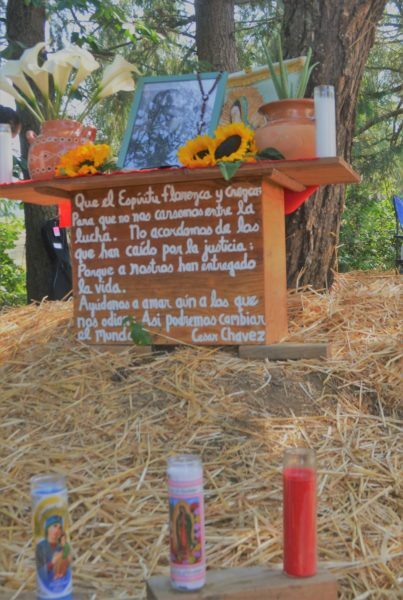 In him and the other farm workers and allies present we saw a commitment to faith and hope, nonviolence and justice. He was the face of joy in the field when showing us fresh blueberries and the inside of a simple warehouse filled with the dreams of a future community. For three days with three farm worker partners, 11 board members, two YAYAs, three staff and Alex’s daughter Maya, numerous allies and friends, two community events and twelve miles, we shared in today’s farm worker movement. Our inspiration was Modesto Hernandez, the leader of the march, Ramon Torres, President of Familia Unidas, and Rosalinda Guillen, Executive Director of Community to Community who were calling us to share their faith and hope and joy in the future of farm workers in Washington state. Twelve more miles on the journey to justice. Si se puede! Yes we can!